The GE OEC 9400 mobile C-Arm is a multi-application system to meet the most demanding needs in Pain Management, General Orthopedic, and Vascular Surgeries. 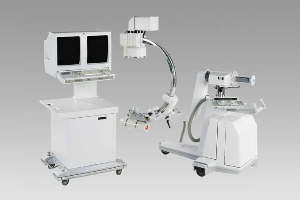 This c-arm offers enhanced imaging penetration and resolution and is capable of fluoroscopy with normal and boost modes (0.2-5.0 mA and up to 20 mA, respectively). It can also operate on continuous or a one-shot basis.The OEC 9400 c-arm is configured with a 9-inch Image Intensifier, and dual 17-inch monitors display the images. It will store up to 60 images, which can be sent to a thermal printer or transferred to an external DICOM box. Serving as the ideal solution for any facility, the OEC 9400 c-arm also features a rotating anode X-ray tube for greater penetration, Digital Image Enhancements, and a Motion Artifact Reduction system. With such a combination of imaging power and machine ease-of-use, operators may find it easier to observe and react with greater accuracy, speed, and confidence. The OEC 9400 c-arm can also be upgraded with specialty packages, such as expanded surgical platforms and special procedure modules.